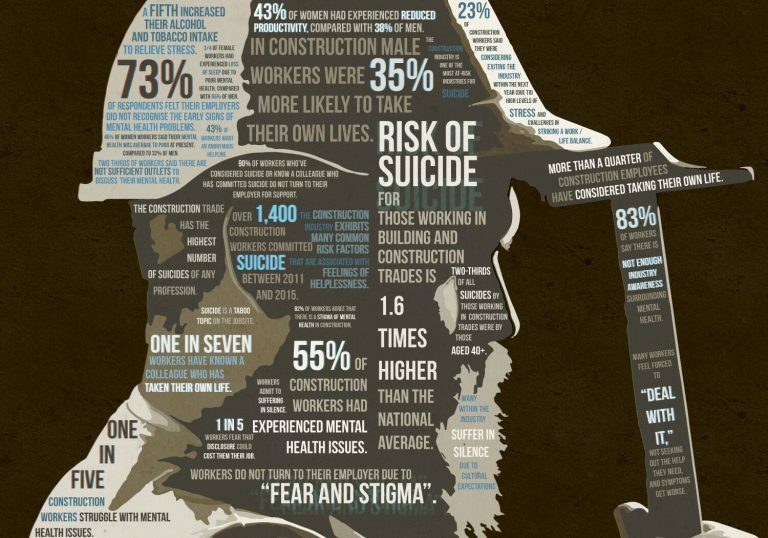 The construction industry has the highest number of suicides of any profession with 1,400 workers taking their own lives over the course of only four years. Further statistics show that one in seven workers knows a colleague who has taken their own life and many more workers have considered it. One big factor that jumps out of the many surveys that have been conducted around this topic is the fact that many workers have admitted to suffering in silence due to cultural stigmas that are predominant within the construction industry. Often workers feel like they cannot talk about their troubles and that, if they did want to speak to someone about it, that there is simply nowhere to do so. It also appears that workers don't feel comfortable reaching our to their boss or senior management with the main causing being “fear and stigma” to do so with as many as 1 in 5 saying they felt their job would be at risk if they did so. Statistics also show that amongst these workers who’ve considered suicide or know a colleague who has committed suicide, 90% do not turn to their employer for support. This then reinforces the cultural pressure to “deal with it,” and results in vulnerable people not seeking out the help they need, and symptoms eventually manifesting and worsening. If you are struggling with a mental health issue there are many ways you can find help. Your GP will be able to make an initial diagnosis and point you in the right direction for further treatment. There are charities and third-party organisations that offer free help and listening services such as the Samaritans and SANEline. However, if you are more open about talking about how you are feeling, always talk to friends & family as they will know you better than anyone. Another route could be co-workers or your employer as they’ll be able to relate work-wise with your issues. Whichever options you choose, the first step is to just talk about it.